← Explore Chicago on the Holiday Lights Trolley or Santa Train! There’s no shortage of psychedelic bands in Chicago’s social scene, which is why a single day festival celebrating the trippy offshoot of rock ‘n’ roll launched back in 2009. But the upcoming third annual installment of the festival, dubbed “Third Eye Visions,” will not only take place at the quaint local music mecca The Hideout in early January, but the event will also expand to two days. 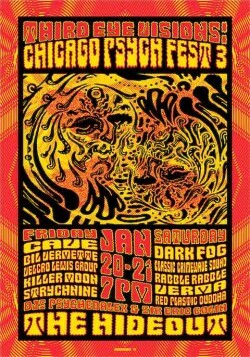 Kicking off on Friday, January 20, Psych Fest will rock The Hideout for a second straight day on Saturday, January 21. This year’s lineup offers both well established and up-and-coming Chicago psych rock acts. Friday Headliners CAVE have really gained buzz recently with the release of their new record, Neverendless, which received a favorable score of 7.9 our of 10 from Pitchfork.com. On the record the band not only offer up psychedelic tendencies but also delve into synth-pop and krautrock territory. Dark Fog headlines on Saturday and brings a more guitar-oriented attack that’s occasionally reminiscent of the more swirling sonic attacks of the Smashing Pumpkins. But be sure to get there early because the fest’s undercard is quite strong as well. On Saturday, there’s local flower-punks Rabble Rabble, who aren’t exactly psychedelic by nature, yet fit because of their rowdy grooves. Then Killer Moon, who conjure up classic ’60s headiness with dark Hendrix-influenced leads and heavy Black Sabbath rhythms, perform on Friday, and experimental outfit Verma will no doubt impress with their driving, edgy aural assaults. Tickets for Chicago Psych Fest III can be purchased for $10 right now at Hideoutchicago.com. And check out the full line-up after the jump.